Thyroid disorders account for a large proportion of pediatric endocrine disorders, being the second most common after diabetes in children worldwide. Thyroid dysfunction in infancy and childhood results in metabolic abnormalities and also affects growth and development. Thyroid hormone-dependent effects on tissue maturation are developmentally regulated and organ or tissue specific, hence the clinical consequences of thyroid dysfunction depend on the age of the infant or child. Untreated hypothyroidism in the fetus or newborn infant results in permanent abnormalities in intellectual and/or neurological function, while after the age of 3 years, hypothyroidism results in slow growth and delayed skeletal maturation. The UNICEF estimates state that 8% of newborns from sub-Saharan Africa are unprotected from learning disabilities resulting from iodine deficiency-related disorders. In children and adolescents, the range of iodine deficiency disorders includes goiter, subclinical hypothyroidism, impaired mental function, retarded physical development, and increased susceptibility of the thyroid gland to nuclear radiation. In spite of the well-recognized profound effect of thyroid dysfunction in children, there are very few studies that have examined childhood and adolescent thyroid disorders in Nigeria.,,, The incidence of thyroid disorders in children appears to be increasing. The etiology, prevalence, clinical presentation, and clinical course of thyroid disorders in children and adolescents substantially differ from that of adults. Furthermore, studies have also shown that thyroid anomalies differ from one population to another. Therefore, this study sought to document the pattern of thyroid disorders in children and adolescents seen at the Lagos University Teaching Hospital (LUTH) over a 10-year period and highlight some management challenges encountered. It is hoped that awareness can be created about the pediatric thyroid disorders in our environment to facilitate timely diagnosis and prompt management. This was a retrospective descriptive study in which data were extracted from the case records of all the patients aged from birth to 18 years with thyroid disorders seen at the LUTH from January 1, 2006 to December 31, 2015. Sociodemographic information and other information such as age at presentation and presenting symptoms were extracted. Other relevant information such as duration of symptoms before presentation, examination findings at presentation, investigation results, complications, family history of thyroid disorders, and management were also extracted. Thyroid disorders were diagnosed based on clinical presentation, thyroid function tests (free thyroxine [FT4], free triiodothyronine [FT3], and serum thyroid-stimulating hormone [TSH]), serological tests, and radiological imaging. The Health Research and Ethics Committee of the LUTH approved the study and waived the requirement for informed consent. Data extracted were collated on a Microsoft 2010 Excel sheet and analyzed with SPSS version 20 (IBM SPSS Statistics for Windows, Armonk, NY: IBM Corp). Univariate analysis was carried out for all major variables of interest. Continuous variables were tested for skewness of distribution. Normally distributed variables were presented as mean (±standard deviation) while skewed data were summarized using median with minimum and maximum values (range). Where applicable, the World Health Organization (WHO, Geneva) AnthroPlus software was used to refer anthropometric variables which had been converted to Z-scores and referenced to the WHO Child Growth Standards and WHO Reference 2007. Weight-for-age Z-scores (WAZ) could not be computed for children aged ≥10 years because the WHO Reference 2007 did not provide standards for this age group. Using this reference, children with height-for-age Z-score (HAZ) <−3, −3 to <−2, −2 to + 3, and >+3 were classified as severe stunting, stunting, normal, and very tall, respectively, while body-mass-index-for-age Z-score (BMIZ) <−3 is severe wasting, −3–<−2 is wasting, −2 to +2 is normal, >+2 to +3 is overweight, and >+3 is obese. A total of 546 children with endocrine diseases were seen out of 52,800 new cases in the outpatient clinics (incidence of 1.03%). Seventy-one out of these children had thyroid disorders, thus constituting 0.13% of all cases (incidence of 1 per 1000 of new cases) and 13.4% of the pediatric endocrine diseases. There were 32 males and 39 females with a male: female ratio of 1:1.2. The median (range) age at presentation was 1.6 (0.001–14) years. The youngest patient was a 7-h-old newborn female infant that was born to a mother being managed for Graves' disease. [Table 1] summarizes the different diagnoses seen in the patients. Children with CH constituted the greatest majority of the patients (46.7%). Among these, 17 children (11 males, 9 females) were managed for CH without an obvious clinical syndrome with a male:female ratio of 1.2:1. Two out of these 17 cases (a 4-year-old male and a 19-month-old female) were privileged to be delivered in a country where newborn screening for CH was available and were diagnosed shortly after birth and subsequently commenced on thyroid hormone replacement with L-thyroxine. These two patients presented to our center for follow-up. The median (range) age at presentation of the remaining 15 was 9 (range: 1.5–24) months. The major presenting features were poor growth, delayed achievement of developmental milestones, and excessive sleepiness/sluggishness among others as shown in [Figure 1]. One of the female children with CH who presented at the age of 5 months was also subsequently diagnosed with sickle cell anemia at the age of 4 years. The next major group of children being managed for CH included patients with Down syndrome (DS). They comprised of nine males and six females giving a male: female ratio of 1.5:1 and constituted 45% of the total patients managed for CH. The median (range) age at presentation of these patients was 9 (range: 3–60) months. Eight (53%) out of the 15 cases of DS had associated congenital heart defects. One patient also presented at 18 days of age with features of Noonan syndrome and associated CH. The patients managed for acquired hypothyroidism (AH) comprised of six males and four females (male:female ratio of 1.5:1). The median (range) age at presentation was 6.75 (range: 3–13) years. Associated conditions in the five patients with nongoitrous cases included obesity, seizure disorder, precocious puberty, tuberculosis, and a combination of autoimmune thyroiditis with vitiligo, respectively. Among the other five who had a goiter at presentation, antithyroid peroxidase antibodies were elevated in two patients who could afford to pay for the tests. The other group of patients managed for hypothyroidism included six patients (three males and three females) with multiple anterior pituitary hormone deficiency. Four patients had confirmed growth hormone deficiency and two males presented with associated micropenis. Although there were no overt symptoms and signs of adrenal insufficiency, only three patients had enough funds to rule out associated adrenal insufficiency before the commencement of levothyroxine therapy. All the patients with CH were commenced on levothyroxine tablets at a dose of 10 μg/kg by mouth once daily aiming to normalize serum TSH and maintain FT4 in the upper half of the reference range and adjusted subsequently as necessary. The patients with AH were commenced on levothyroxine tablets at a dose of 5 μg/kg once daily and dose adjusted to maintain a euthyroid state. Other groups of disorders seen were euthyroid sick syndrome (ESS) and Graves' disease as summarized in [Table 1]. The two patients managed for ESS were a 16-month-old female with protein–energy malnutrition and a 3-month-old female infant with sepsis. Thyroid functions of the patients with ESS showed serum low FT3, FT4 on the lower limit of normal, and increased TSH. They were both treated with low-dose thyroxine (25 μg daily) which was discontinued on recovery about 4 weeks after discharge. Subsequently, at follow-up, the patients have remained euthyroid. One 9-year-old girl had a simple goiter with euthyroidism and another 7-year-old girl was managed for acute thyroiditis. The analysis of the clinical profile and anthropometry of the nine female children with hyperthyroidism is shown in [Table 2]. The mean age at presentation was 9.4 ± 2.09 years. Eight (88.9%) patients were in the pubertal age range. The WAZ scores for the five patients aged below 10 years were computed and the median (range) was 0.36 (range: −0.46–1.16). The HAZ scores for all the patients were normal with a median (range) of 1.42 (range: 0.08–2.91). The median (range) BMIZ score was –1.9 (–3.11 to– 0.45). Six out of the nine (66.7%) had normal BMIZ scores, two (22.2%) patients had wasting while one patient (11.1%) had severe wasting. Clinical features in all the patients included goiter, weight loss, heat intolerance, exophthalmos, tremors, and tachycardia. Graves' disease was confirmed in five patients (55.6%) with elevated thyroid receptor antibodies who could afford to pay for the test. All the patients were treated with carbimazole which was started at the dose of 0.5 mg/kg/day in 2–3 divided doses and titrated to the lowest possible dose needed to maintain a euthyroid status in the patient. In addition, because of the features of severe cardiovascular hyperactivity such as palpitations and tachycardia in all the patients, they were also commenced on a β-adrenergic blocker, propranolol, at a starting dose of 0.5 mg/kg/day in 2–3 divided doses for varying duration of time. Eight infants of mothers on treatment for hyperthyroidism ( first seen between the 7th h of life to 2 months of age) had transient hypothyroidism while one who presented at the age of 8 days had a transient hyperthyroidism. The incidence of thyroid disorders in the current study was 1 per 1000 cases with a rate of 0.13%. This is comparable to the rates of 0.12% and 0.1% documented in recent reports by Onyiriuka et al. and Jaja and Yarhere  from Benin and Port Harcourt, both in South-South Nigeria, respectively. This rate is, however, higher than the incidence of 0.07% reported in a previous Nigerian study by Laditan and Johnson  in Ibadan, South-West Nigeria, done about 40 years ago. The higher incidence rates of the index study and other relatively recent studies , may be related to more awareness about pediatric endocrine diseases in the country due to the development of the subspecialty in Nigeria and training of more medical personnel. With regard to the extent endocrine diseases contribute to the burden of pediatric consultations, the percentage of 1.03% in the present study is slightly higher than the rates of 0.72% in Benin and 0.2% in Ibadan, both in Nigeria,. In spite of these differences, the essential point is that, despite the huge burden of infectious diseases and nutritional disorders plaguing the region, endocrine disorders occur in Nigerian children and provision for care is advocated at all levels of health care. Thyroid diseases also constituted a significant proportion of the pediatric endocrine disorders. The proportion was similar to the report by Onyiriuka and Kouyaté where it constituted about 12.1%. However, this percentage is lower than that recorded by Jaja and Yarhere  (29.3%) and Laditan and Johnson  (37%) while being higher that the proportion of 6.4% recorded by Jarret et al. in Ibadan 33 years later after Laditan and Johnson. Comparably also, it is reported that 12% of the United States population will develop a thyroid condition in their lifetime. In spite of the varying proportions, it is clear that thyroid disorders constitute a significant burden of the pediatric endocrine disorders encountered and require attention. There was a slight female preponderance in the cases seen in the index study as has been documented in many other studies ,, except the Port Harcourt study  in which the thyroid disorders seen were 1.7 times more common in males. The reasons for this difference are not immediately obvious but may be related to the age groups of the patients and the predominant specific thyroid disorders encountered in the various studies. The youngest patient reported in our study was seen at 7 h of age. However, the youngest age at presentation from other Nigerian studies ,, varied from 5 days to 4 months while another Indian study by Yelluri  recorded the youngest age at presentation as “<1 month.” Variation in age at presentation may be related to the nonavailability of newborn screening for hypothyroidism and awareness among both health workers and the general populace in these settings. Furthermore, synergy between the physicians managing the pregnant mothers with thyroid disorders may affect how early the newborns of such mothers are screened for thyroid disorders. DS constituted about 45% of the total cases of the patients with CH in the current study. Even though the scope of this study did not determine the percentage of thyroid disorders among all the patients with DS in LUTH, previous studies , and more recent reports , have documented rates of overt hypothyroidism in patients with DS ranging from 7% to 23.5%. Furthermore, Fort et al. had reported that persistent primary CH is 28 times more common in infants with DS than the general population of healthy newborns. Erlichman et al. documented that T4-based screening does not identify many cases of CH in neonates with DS and therefore recommends that the screening approach to infants with DS should initially include simultaneous T4 and TSH because of the possibility of missing patients with compensated hypothyroidism (i.e. that present with moderate TSH elevation sufficient to normalize FT4 concentrations), which neonates with DS frequently have at birth. AH constituted a similar proportion to the 10% reported by Jaja and Yarhere. This is, however, lower than the percentage of 47.5% documented by Yelluri. Both goitrous (Hashimoto thyroiditis) and nongoitrous (atrophic thyroiditis) variants of chronic lymphocytic thyroiditis are common causes of AH. The most common age at presentation is adolescence, but the disease may occur at any age, as seen in our study where the age ranged from 3 to 13 years. However, because of financial constraints and lack of health insurance services for extensive investigations as also encountered by Jaja and Yarhere  in similar “resource-constrained” settings, it was difficult to determine the specific causes and course of these acquired thyroid disorders except in three out of ten patients in the index study. A review of the epidemiology of thyroid diseases in Africa by Ogbera and Kuku  had also noted that the scope of antibody profiles in cases of suspected autoimmune thyroid diseases in Africa is unknown because the focus of management is treating clinical manifestations with the available meager resources rather than carrying out in-depth investigations. The patients with hypothyroidism associated with MAPHD in the present study probably had TSH deficiency. Reports indicate that such TSH deficiency may be isolated or associated with other pituitary hormone deficiencies especially growth hormone. Secondary or tertiary hypothyroidism in less severely affected children with the congenital abnormalities may be recognized only later in childhood  as was encountered in patients in the index study who presented between the ages of 4 and 14 years. The percentage of patients with hyperthyroidism in the current study is similar to the rate of 11.1% reported by Yelluri. This is lower than the rates of 27.8%–66.7% documented in previous Nigerian studies ,, but higher than the rate of 2% documented by Desai  in India. These differences might be related to the specific causes of hyperthyroidism and genetic and environmental influences in the various studies. More than 95% of cases of hyperthyroidism are due to Graves' disease, the predominantly documented of the autoimmune diseases of the thyroid gland in Africa, with a strong female predisposition, as was noted in the index study. It is also common in adolescence as only one prepubertal patient was seen fortunately because prepubertal children tend to have more severe disease, to require longer medical therapy and to achieve a lower rate of remission as compared with pubertal children. Even though the ophthalmopathy characteristic of Graves' disease in adults is said to be considerably less common in children, all the children seen in the present study as well as previous Nigerian studies ,, had significant exophthalmos at presentation. It is not immediately obvious whether this common occurrence is related to long duration of symptoms and late presentation or some racial predilection. Further studies are needed to elucidate this observation. Transient neonatal hypothyroidism may develop in babies whose mothers are being treated with antithyroid medication or when maternal TSH receptor-blocking antibodies cross the placenta to the fetus intrauterine  as was documented in the current study and in a previous Nigerian study. Replacement therapy is not usually required. Usually, the hypothyroidism resolves in 3 or 4 months. Conversely, transient neonatal hyperthyroidism which occurred in one of the babies born to a mother with Graves' disease almost results from the transplacental passage of maternal TSH receptor-stimulating antibodies. Similarly, a more affected infant was managed for transient neonatal thyrotoxicosis in the report by Jaja and Yarhere. A limitation of the present study was the nonavailability of extensive investigations, especially in the cases of suspected autoimmune disorders of the thyroid to fully document the pattern of predominant antibodies. In conclusion, pediatric thyroid disorders are common and CH constituted a majority. In view of the preventable mental retardation that can occur if not treated promptly, newborn screening is advocated in the country. Meanwhile, clinicians should maintain a high index of suspicion for CH. Newborns of mothers with thyroid illnesses should also be screened and followed up for optimal results. The authors wish to appreciate Dr. Shobanjo for his contributions toward data acquisition for this study and also the medical records' officers for assistance in retrieval of patients' records. Becker KL, Nylen ES, Snider RH. Endocrinology and the endocrine patient. In: Becker L, Ronald CK, Rebar RW, editors. Principles and Practice of Endocrinology and Metabolism. 3rd ed. Philadelphia: Lippincott, Williams and Wilkins; 2002. p. 82-5. Brown RS, Huang S. The thyroid and its disorders. In: Brooks CG, Clayton PE, Brown RS, editors. Brooks Paediatric Endocrinology. 5th ed. Massachusetts: Blackwell Publishing; 2005. p. 218-53. Available from: http://www.unicef.org/special session/about/sgreport.pdf. [Last accessed on 2016 Feb 09]. Laditan AA, Johnson AO. Thyroid gland disorders in African children. J Natl Med Assoc 1979;71:139-41. Edino ST, Mohammed AZ, Ochicha O. Thyroid gland diseases in Kano. Niger Postgrad Med J 2004;11:103-6. Onyiriuka AN, Abiodun PO, Onyiriuka LC. Thyroid disorders in childhood and adolescence: Analysis of clinical data and management challenges seen in a Nigerian Teaching Hospital. Greener J Med Sci 2012;2:45-50. Jaja T, Yarhere IE. Clinical characteristics of children and adolescents with thyroid disorders seen at the University of Port Harcourt Teaching Hospital: A five – year review. Niger J Paediatr 2014;41:302-6. Bettendorf M. Thyroid disorders in children from birth to adolescence. Eur J Nucl Med Mol Imaging 2002;29 Suppl 2:S439-46. WHO. WHO AnthroPlus for Personal Computers. Manual: Software for Assessing Growth of the World's Children and Adolescents. Geneva: WHO; 2009.
WHO, editor. Training Course on Child Growth Assessment. Geneva: WHO; 2008. Onyiriuka AN, Kouyaté M. Paediatric endocrine disorders as seen at the University of Benin Teaching Hospital over a ten-year period. Niger J Paediatr 2014;41:316-20. Jarrett OO, Ogunbosi BO, Ayoola OO. Paediatric endocrine disorders at the university college hospital, Ibadan: 2002-2009. Ann Ib Postgrad Med 2013;11:96-101. American Thyroid Association. 86th Annual Meeting of the American Thyroid Association 2016. General Information/Press Room. Media: Main-About Hypothyroidism. Available from: http://www.thyroid.org. [Last accessed on 2016 Oct 09]. Yelluri SK. Incidence and etiology of thyroid disorders in children. Int J Contemp Pediatr. 2016;3:593-6. Ogbera AO, Kuku SF. Epidemiology of thyroid diseases in Africa. Indian J Endocrinol Metab 2011;15(Suppl 2):S82-8. Brown RS. Disorders of the Thyroid Gland in Infancy, Childhood and Adolescence. Available from: http://www.thyroidmanager.org. [Last updated on 2012 Mar 21; Last accessed on 2016 Feb 07]. Delange F. Neonatal screening for congenital hypothyroidism: results and perspectives. Horm Res 1997;48:51-61. Unachak K, Tanpaiboon P, Pongprot Y, Sittivangkul R, Silvilairat S, Dejkhamron P, et al. Thyroid functions in children with Down's syndrome. J Med Assoc Thai 2008;91:56-61. Purdy IB, Singh N, Brown WL, Vangala S, Devaskar UP. Revisiting early hypothyroidism screening in infants with Down syndrome. J Perinatol 2014;34:936-40. Iughetti L, Predieri B, Bruzzi P, Predieri F, Vellani G, Madeo SF, et al. Ten-year longitudinal study of thyroid function in children with Down's syndrome. Horm Res Paediatr 2014;82:113-21. Moosa S, Segal DG, Christianson AL, Gregersen NE. Thyroid dysfunction in a cohort of South African children with Down syndrome. S Afr Med J 2013;103:966-70. Erlichman I, Mimouni FB, Erlichman M, Schimmel MS. Thyroxine-Based Screening for Congenital Hypothyroidism in Neonates with Down Syndrome. J Pediatr 2016;173:165-8. American Academy of Pediatrics. Committee on Genetics. American Academy of Pediatrics: Health supervision for children with Down syndrome. Pediatrics 2001;107:442-9. Carroll KN, Arbogast PG, Dudley JA, Cooper WO. Increase in incidence of medically treated thyroid disease in children with Down Syndrome after rerelease of American Academy of Pediatrics Health Supervision guidelines. Pediatrics 2008;122:e493-8. Zargar AH, Ganie MA, Masoodi SR, Laway BA, Bashir MI, Wani AI, et al. 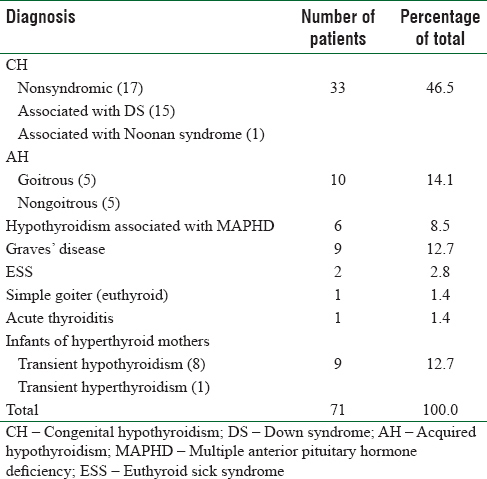 Prevalence and pattern of sick Euthyroid syndrome in acute and chronic non-thyroidal illness – its relationship with severity and outcome of the disorder. J Assoc Physicians India 2004;52:27-31. Economidou F, Douka E, Tzanela M, Nanas S, Kotanidou A. Thyroid function during critical illness. Hormones (Athens). 2011;10:117-24. Desai MP. Disorders of thyroid gland in India. Indian J Pediatr 1997;64:11-20.